Cooking a steak in water does not sound appetizing at all, but surprisingly this method yields one amazing piece of protein. Steak itself is a tricky beast to tame. I can still remember my first encounter tackling this piece of meat. Fresh out of the dorms in college I started cooking for myself in my apartment. I mastered the art of stir frying chicken and broccoli passed down by my mother, but unfortunately that was the only skill I learned before I was left to fend for myself. Luckily my dad, the grill master, loves a juicy steak and packed me a Costco supply of steaks frozen for my convenience and to mix it up my meals a little. I took one slab of meat out, thawed it for a few hours, and called my dad for instructions to reassure myself that everything would be fine. "Salt and Pepper. Cook on one side for 4 minutes. Flip. Cook for 4 more minutes. A splash of soy sauce." And there you have it, the Chan Family secret for a perfect steak. Little did I know that there was more to it than that. I placed my steak on the oiled pan and waited 4 minutes while reciting the steps in my head. I pulled my finished steak off, plated it, and cut into a cold raw steak in the middle. Discouraged, I sliced up my steak into thin slices and cooked it the only way I knew how. Stir fried with BROCCOLI. I was traumatized. I ended up slicing all the steaks my dad gave me and turned them into stir frys for the rest of my college career. After the struggle of cooking a cow ton of failed steaks and researching, I have learned many methods and myths behind cooking steaks and can now pan-sear a steak worth eating. However, all of that can be forgotten with low-temperature cooking in a water bath. Once you go bath, you don't go back. Cooking sous vide is not as complicated as its fancy name might sound. All that is required is to seal your ingredients in a bag, place them in a water bath, and hold it at your target temperature. Once your food reaches your target temperature or time, you remove it, sear it off and serve it. The method yields results that you normally could not achieve by conventional means. Medium-rare steaks cooked sous vide will be medium-rare edge to edge for the entire thickness of the meat and browned with a savory crust on the outside. However, grilling or pan searing a steak will produce a gradient of doneness with only 50% of the meat actually "medium-rare". What determines the doneness of your steak is the temperature that the meat is reaches to (see below). For example, raising your steaks temperature to 135 °F (57 °C) will give you a medium-rare steak. When frying up some steaks, your pan reaches temperatures in the range of 550 °F (290°C), way above the temperature you want your meat to be. When cooking your steak, your job is pull your steak right off the flame when your center reaches your desired temperature. Time is important with this method, but is highly variable depending on the starting temperature of the meat, the thickness, the pan, carry over cooking and the burner performance. 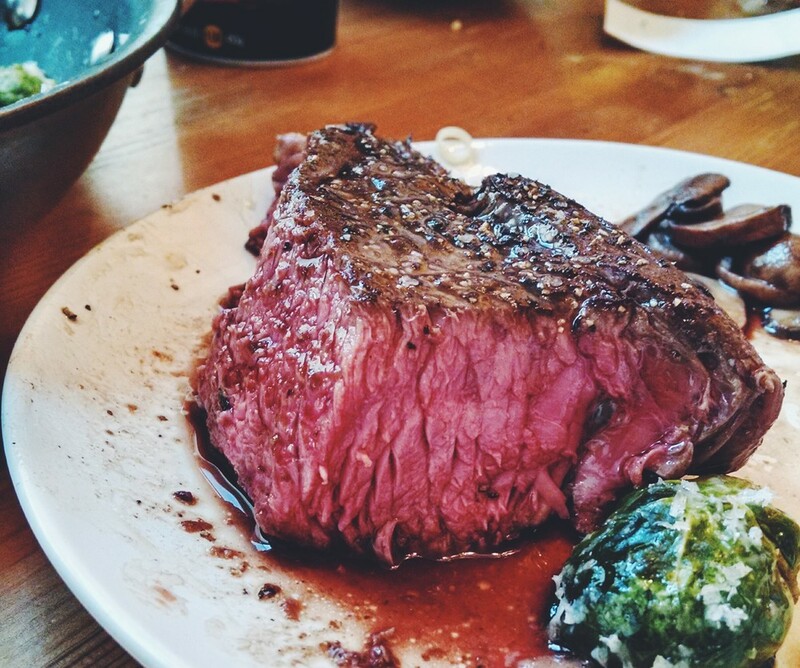 If you miss your chance, your steak can go from a juicy medium-rare to well-done in minutes. With your water bath, all your worries of over cooking will be remedied. You steak will never rise above your selected temperature. All you need to do is let your steaks come up to temperature and reach equilibrium with your bath (typically 45 minutes to an hour for 1 inch steaks/pork chops). Cooking in a water bath gives you the precision to cook a medium-rare steak consistently perfect everytime. Are you waiting for late guests? No worries, you can leave your steaks chilling in the bath and fry them off when they arrive. It will taste exactly the same as it would have been hours earlier. Pick your temperature based on your desired doneness and set your water bath accordingly. If you do not have a water bath you can used an improvised techniques as seen on Serious Eats or by heating water on the stove and constantly monitoring the temperature seen on Chef Steps. Heat up a thick bottom pan, oil, and place steaks in when oil starts to smoke. Sear your steaks for about 30 seconds on each side until you get browning. Presearing will start developing flavors by getting the Maillard Reaction (interaction between sugars, protein and heat) going and will reduce the amount of time to develop a crust after taking the steak out of the water bath. Also it will kill any bacteria on the surface of the meat. If you have time, place your steaks in the freezer for 30 mins - 1 hour to freeze the surface before searing. This will prevent the inside of the steak from cooking too much. Place your meat in a ziploc bag (or vacuum seal) with some oil, place aromatics if desired, but do not salt. Salting at this point can cure the meat slightly and affect texture. If using a ziploc, remove the air using a water displacement method. Hang bag over the edge of your container and slowly lower your meat in. As you lower the bag, the pressure of the water on the bag will push the air out. Seal the bag when all the air is removed. Once your bath is up to your desired temperature, place your meat in the bath. For a 0.5 steak this is about 15 minutes. For a 1.5 in steak this is about 90 minutes. For a 2 in thick steak this is about 2 hours. If you are cooking multiple steaks at once, make sure you do not over pack your water bath. This can cause temperature pockets and can result in bacterial growth. You should not eat your steak if the bag has puffed up or smells like death. Take your meat out of your bag and pat dry with a paper towel. This will remove moisture from the surface and allow you to develop a crust on your meat quickly. Heat up a thicken bottom pan on high, heat up your oil, and fry your steak until it develops a nice thick crust. No more than a minute on each side. Remove from the pan, season, and rest for 2 to 3 minutes.